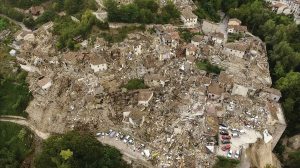 An August 2016 earthquake in the Apennine Mountain region of Central Italy “took everything from [residents]—everything they had,” says BYU civil engineering professor Kevin W. Franke (PhD ’11). Soon after rescue efforts for the lethal 6.2-magnitude temblor were completed, Franke spent a week in the region as one of four U.S. professors invited to a special geotechnical engineering reconnaissance mission. The goal? Learn how the earthquake impacted infrastructure. With the help of BYU student and drone pilot Brandon I. Reimschiissel (’18), Franke recorded more than 50 gigs of high-resolution visual data, which is being used to create 3-D computer models of the aftermath that will be accessible to researchers around the world. “Looking at the imagery we took, it gave me resolution and purpose, realizing what we’re doing is important so that hopefully . . . this [level of devastation] doesn’t happen again,” says Franke, who returned to the region in December to assess further damage caused by an October quake. BYU researchers have discovered what the Emerald ash borer can’t see—and it may be the key to saving ash trees. With 183 LED lights embedded into Y Mountain, the Y is now lit with the flip of a switch on campus.